Xiaomi announced the Redmi Note 5 Pro with dual cameras last week and today was the first flash sale of the phone. According to Xiaomi India, over 300,000 units sold out in less than three minutes, but enraged fans took over the Reply button on Twitter, explaining the phone was out of stock in 10 seconds, and some orders were even canceled after that. 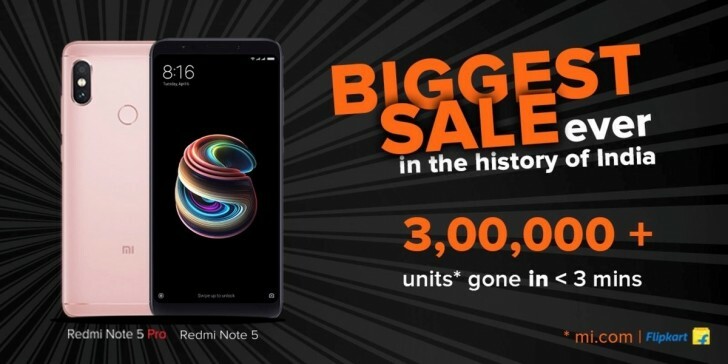 The first flash sale of the Redmi Note 5 Pro was boldly called “the biggest sale in the history of smartphones” by Xiaomi India. One user responded with “stop fooling us”, then explaining the site crashed “within a second” and criticizing availability. The Xiaomi fan @yuvaraj3003 said the “out of order” sign appeared in just 10 seconds. Xiaomi India scheduled a new flash sale on mi.com and Flipkart for February 28. The Redmi Note 5 Pro comes in four colors - Champagne Gold, Rose Gold, Light Blue and Black. The price for the 4 GB RAM + 64 GB storage variant is INR13,999 ($215/€175), while the version with 6 GB RAM costs INR16,999 ($261/€212). Today again this happened. The phone went out of stock in just 5-10 seconds.. Its irritating..